Slipcovers 101, simply put, are either a face lift or wardrobe for furniture. Slipcovers have been around for centuries. In their early years slipcovers served the main purpose of protecting the upholstery on furniture, a garment if you will. Fine fabrics commonly used in the day, such as damask and silks, would age quicker with daily use. So slipcovers were used to preserve the stationary fabrics on furniture and then could be easily removed to allow the owner to 'show' their processions when guest were invited. Since then, the uses of slipcovers have dramatically changed. Both fabrics and slipcovers have evolved to more practical uses. Although, in some instances, silks and damask are still used but more practical fabrics are readily available and highly recommended. Slipcovers serve many different purposes. 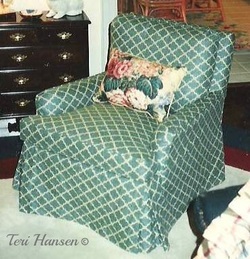 Having grown up around slipcovers and making them for others, I absolutely love the look and convenience of them. I'd like to share some suggestions, helpful hints & ideas with you if you are considering slipcovers for yourself. Please note that all pictures shown here are all slipcovers that I have created over the years, a mini portfolio of my work. So follow along and if you should have any questions regarding any of this information feel free to contact me. Thanks for stopping by for a visit I hope you find this helpful. ...are They Right for Me? The practicality of slipcovers is a personal decision and choice. Before you answer the question let’s explore different types of slipcovers. Ready made slipcovers are a large piece of fabric that covers your entire furniture. These ‘one size fits all’ throws do not have much shape since furniture varies in sizes. The throws will vary in size according to the piece intended to cover i.e. chair, loveseat and sofa sizes. They have become more readily available in home décor departments. When the cover is placed on your furniture it will be necessary to tuck in extra fabric, to the inside, to shape the cover to your furniture. The inside of the arms tuck into the seat and back and the seat tucks into the back. Ties or possibly elastic are generally the provision for drawing in the cover and holding it to your furniture. You can also purchase handy little tools called 'corkscrew pins' to help hold the shape of the cover in place. These covers are affordable and give you a quick instant fix. The problem with this particular solution is that after you have taken the pain staking task of shaping the cover nice and neatly to fit your furniture, it comes undone after the first use and constant re-tucking is generally needed to achieve the neatly shaped appearance again. Custom fit slipcovers are made specifically to fit your individual piece of furniture. A proper custom slipcover should have a removable cover for the body and a removable cover for any loose cushions on the furniture. Consider it as unattached relaxed upholstery. Custom slipcovers are also made with excess fabric for tucking into where the inside back and arms meet and where the deck (seat area under the cushion) and inside arms meet as well. These tuck-ins help to keep your slipcover in place with less shift than the unfitted cover since it is a separate cover for the body of furniture. There will still be shifting in any slipcover but with the tuck-ins it helps to reduce that shift. Custom fit slipcovers will be more costly since you are paying for a custom fit to your specific furniture. The advantage? You won’t see another one like in anyone else’s home. With these two distinctions made let’s consider other things as well. Do you like your furniture or would you rather replace it? Does your furniture need to be repaired? Do you prefer upholstery vs. slipcovers? What is your lifestyle? Children; no children; animals (the 4 legged kind); casual; formal. What is you décor preference? Tailored, French country, Traditional, Eclectic, Yard Sale? Slipcovers can fit in any of these décor genre but you need to know which you prefer to get the end result. What about your household budget? Ready made slipcovers are not as expensive as the custom fit slipcovers. There is an investment to get the custom look, but don’t think it’s so expensive that you can’t afford it. You may be surprised, keep an open mind and shop around. Again it’s what your household budget can handle. Slipcovers have been a viable option for many years, extending the life of your furniture and instantly changing your room décor. When you choose a custom slipcover there are more options available to you. In this before and after photo here you see a prime example of an old Duncan Phyfe sofa that is very worn out but in the next picture it has been given a new face lift with a new cover. With the exception of recliners having too many moveable parts, any piece of furniture can be slipcovered. Although I have witnessed my mother [pictured above] making a slipcover for a recliners over the years I apprenticed with her so it would depend entirely on the contractor you choose. I won't do recliners myself but that is my personal choice as a contractor. These are just the few I thought of, surely you can think of more. Let's look at some creative ideas for a true custom look for you. How daring are you? Would you be willing to take a risk and find out that you absolutely love it? When going with a custom slipcover it's easy to see your ideas come to life. Here are some simple tips to consider when creating unique looks for your custom covers. Use Slipcovers to change out your room's seasonal decor. Use a separate cover for each season, such as a light cover for the warm months and a darker cover for the cool months. Monogramming instantly personalizes your look. Embellish using decorative or contrast cording, buttons or ties. Skirts are an easy way to 'change up' a slipcover's look. Ruffle vs. Tailored for a French country, deeper than normal length tailored for a more contemporary casual look or go skirtless and quit hiding those beautiful legs. Really shake it up throughout the entire piece and combine 2 to 4 different coordinating fabrics in one slipcover. Use a solid fabric for your entire piece as a back drop and load it with the variety of accent pillows. Or combine any of these ideas for your own unique look. In this particular picture a client had an idea for a very unique idea for a table slipcover. This was created making a full cover in burlap with a straight skirt. Then to add interest a gathered skirt and the walls of sheer were incorporated into the design. That was definitely a custom creation. What's the Best Fabric to use? What's the best fabric to use for slipcovers? Let me first ask "what are you slipcovering?". That's where you need to start. Where will the furniture be placed in your home? How will your furniture be used? Will you need to wash it? Is it just to protect your furniture underneath or is it decorative? You can make a slipcover out of any most any type of fabric but consider if it will be practical for the use. The type of fabric I most commonly recommend to my clients is a drapery or decorator weight fabric, mostly cotton, polyester or blends. It’s washable and wears very well. Twill and denim work up very nice, it is durable and cleans very easily. Upholstery fabric is not normally recommended for slipcovering as it would be for re-upholstery. Joints on slipcovers sometimes have 6-8 layers of fabric which makes it nearly impossible to sew on plus it makes the slipcover bulky at joints. But if upholstery weight is what you are looking for, you need to consider eliminating cording in the seams. This acutally gives your furniture a more upholstered look. Dress weight fabric is too lightweight and won’t hold up to the wear and tear of everyday use. If you are covering a piece of furniture that doesn’t get much use and is more for show then a lighter weight fabric will work fine. 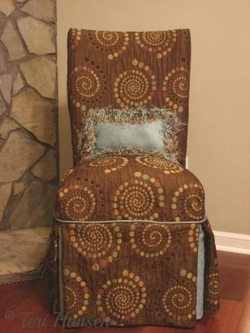 Example: I covered a small bedroom chair for my mother-in-law about 10 years ago, it is used exclusively by her. It has held up very nicely and shows no sign of wear. So don’t let the lightweight fabrics scare you away just proceed with caution. Polyester faux silks are available and provides you with a formal look. It makes up handsomely and can also be washable. Should you decide to use a decorative trim expect to be dazzled by how it will enhance the look. Please note using trim will eliminate the washability of your cover. But again if the chair is not going to be used often then this will be fine and spot cleaning goes a long way. Slipcovers can even be made of sheer to accent a beautiful piece of furniture such as antique dining chairs or a vanity chair that you merely want to display. When selecting your fabrics, printed pattern repeats need to be considered. More fabric will be needed for a larger repeated pattern of 13″ or more. How Much Fabric Will I Need For My Slipcover? How Much Fabric Will I Need For My Slipcover? The question I have for you here is "what are you slipcovering?" Yardage Needed: Below is a chart of estimated yardage needed. Please keep in mind this is just an estimate. It is imperative you allow your contractor advise you of the amount of yardage needed based on your specific project. I encourage you to always consult with your contractor before buying any fabric for your project. They know the right questions to ask and will advise you accordingly. There are many considerations and other variances based on your specific project that need to be factored in which may increase or decrease the amount of yardage needed. Let the expert tell you how much fabric they need provided for the project and trust their expertise. ...and what to look for when considering a contractor? Finding a reputable contractor to make your slipcovers may or may not be an easy task depending where you live. For a mid to large size metro area your more than likely will have more options to finding a contractor whereas living in a more rural area decreases the options. Here are a few suggestions that may help in your search. What Do Custom Slipcovers Cost? ...Is it really worth it? Contractors work under different circumstances so if one is priced way low vs one priced way high be sure to take a few things into consideration. These are all points to take into consideration as you look for a contractor. Seamstresses just getting started in making slipcovers may charge less on their labor to gain the experience, where as a veteran in the trade with a longer waiting list can justify a higher cost of labor for the quality produced. A good guideline for estimating an average price of labor for custom made slipcovers is generally comparable to the cost of labor for re-upholstering. Above all, keep in mind this is custom. You are paying for individuality and uniqueness that someone is creating especially for you. That, is not found in any ready made slipcover. I always recommend to anyone, especially inquiries I receive for custom sewing is to get a minimum of three estimations. Compare cost of labor plus yardage needed based from these factors shared here, only then will you have a good idea if you can afford this and if it is worth it. If you decide to make your own slipcovers I encourage you to go for it!! You will need a basic understanding of sewing. Slipcovers are not, what I would consider, a beginner level project. Compare making slipcovers to dress making for your furniture or putting a puzzle together. There are lots of details and it helps if you can see the big picture in your mind. Start on a small project first to sample how you may like it such as a footstool or armless chair. Beginning on a sofa may become overwhelming and discourage you from completing the task. Take it one step at a time and you’ll get there. WARNING…if you must stop before the project is completed don’t let it sit too long, you may forget where you were once you get back to it and that may also discourage you. There are slipcover tutorials available to watch and I would encourage running through a few to get a feel for what you are about to undertake, plus listed below are some ‘how to’ publications listed and good beginner resources for what’s in store. I apprenticed under my Mother for many years, cutting, doing partial fittings and watching her sew before I ever made my first full slipcover. It absolutely fascinated me. Even at that it took several attempts of making my own before getting the full picture and feeling comfortable enough to offer the service to clients. Two main ingredients to achieve this goal will be patience and time. It’s not easy and not necessarily accomplished in one day but very rewarding with a job well done. Like everything, practice makes perfect and you will learn more with each slipcover completed. If you would like more information on this I encourage you to contact me, I always enjoy knowing when someone has been by for a visit and enjoyed their stay or see room for improvement. Ask me any question you may have if I did not touch on it here, there is always more to learn. Leave a comment.